McCain said the movement is "foolish" to think a balanced budget amendment could pass before the August 2 deadline. At one point, McCain read from an op-ed in Wednesday's Wall Street Journal. That article referred to activists as "tea party hobbits" – the little people who inhabit Middle-earth in the Lord of the Rings series. 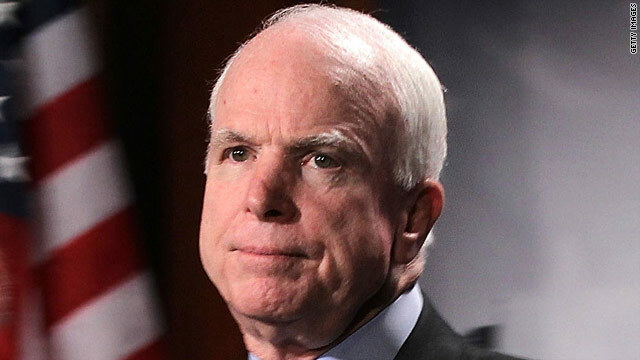 McCain – 2008's Republican presidential nominee – also blasted as "bizarre" an idea supported by current GOP presidential candidate Michele Bachmann, though McCain did not mention her by name. McCain's fiery language comes amid competing Democratic and Republican plans to reduce the deficit. McCain also blasted Democrats in his speech. He called the plan from Majority Leader Harry Reid "full of smoke and mirrors," and said President Barack Obama is leading "from behind" by not offering "a specific plan that perhaps could be considered by both bodies." "It's unfair of the president of the United States ... only to go out and give lectures and act in as partisan a fashion as I have seen in his addresses to the American people," McCain said. When it came to the tea party, McCain was equally biting. He said he fully supports a balanced budget amendment. But he thundered that current political realities make passing one in the near future near impossible. "What is really amazing is that some (Senate) members are believing that we can pass a balanced budget amendment to the Constitution in this body with its present representation – and that is foolish," McCain said. "That is worse than foolish," he continued. "That is deceiving many of our constituents." "To hold out and say we won't agree to raising the debt limit until we pass a balanced budget amendment to the Constitution, it's unfair, it's bizarre," McCain added. "And maybe some people who have only been in this body for six or seven months or so really believe that. Others know better." McCain did not mention which senators he was referring to. But also on Wednesday, Sens. Jim DeMint of South Carolina, Mike Lee of Utah and Rand Paul of Kentucky, tea party boosters, joined many tea party activists who rallied on Capitol Hill demanding passage of the "Cut, Cap and Balance" plan. Among other things, that proposal would cut total spending by $111 billion for fiscal year 2012 and require a balanced budget amendment to the Constitution that would cap total annual spending at 18 percent. McCain talked about Boehner's plan and quoted the Wall St. Journal piece, which said: "The question now is whether House Republicans are going to help Mr. Boehner achieve significant progress, or in the name of the unachievable, hand Mr. Obama a victory." McCain continued reading the article: "The idea seems to be that if the House GOP refuses to raise the debt ceiling, a default crisis or gradual government shutdown will ensue and the public will turn en masse against Barack Obama....Then Democrats would have no choice but to pass a balanced budget amendment and reform entitlements, and the tea party hobbits could return to Middle-earth...This is the kind of crack political thinking that turned Sharron Angle and Christine O'Donnell into GOP nominees. The reality is the debt limit will be raised one way or another." Earlier in his remarks, McCain blasted a position that Rep. Bachmann supports. Saying, "Today we are six days away from a possible default which could plunge this country into a serious crisis," McCain added: "There are those that argue somehow in a bizarre fashion that somehow we could prioritize our payments to the most urgent requirements, such as our veterans, such as Social Security." Bachmann recently co-sponsored a bill that aims to ensure military service members receive their paychecks on time should the nation default. McCain won re-election in last year's midterm elections after a bitter primary with former congressman J.D. Hayworth, who had some tea party support. The nation's largest tea party group is responding to McCain. Mark Meckler is co-founder of the Tea Party Patriots. He told CNN that many Americans support a balanced budget amendment to the Constitution – and "What Republicans should be doing is pushing all the way to the line." As for McCain's quoting the Wall Street Journal's line about "tea party hobbits," Meckler used his own Lord of the Rings metaphor to strike back at the senator. "Clearly he's been corrupted by the ring of power," Meckler said. Republican Sharron Angle, who lost her Nevada Senate bid against Democratic Sen. Harry Reid in 2010 with support from the tea part movement, praised the "hobbits" while taking a jab at McCain. "As in the fable, it is the hobbits who are the heroes and save the land," Angle said in a statement. "It is regrettable that a man seeking dialogue, action and cooperation for votes on the floor of the United States Senate has only one strategy to achieve that effort: name-calling. Nice." McCain is a sell-out to the status-Quo. Why is it that when faced with defaulting on our many cling to the idea that if we do we need to make sure our soldiers get paid? Do we not have a volunteer force, and aren't they supposed to be serving for the greater good? I mean that's what I see in the t.v. ads and in the various news and human interest stories, they are just happy to serve. So why not let them serve without pay for a little while, like the rest of us? That paradigm has been used on so many public employees, they serve for the good of the many, so we don't have to pay them that much. A good case in point would be teachers, teachers on average get paid below $45,000, and many of them have masters degrees and then some. I know soldiers risk their lives, but so do police officers, firefighters, all sorts of federal agents. Maybe the federal government should start doing what companies do, maybe some of the soldiers should get laid off or curtail their benefits. Just a thought. i really respect McCain for the way he spoke of the tea baggers. they are right wing extremists, and should be paid no mind at all. FINALLY> THIS is the John McCain I WOULD HAVE VOTED FOR in 2008 if he HADN'T caved to the far right and nominated PALIN as his running-mate. THIS is the man who I have ALWAYS respected as intelligent, a proponent of rational compromise when needed and who would have made a fine President. I am just sad that he caved so far in 2008. JOHN-RUN AGAIN-but THIS TIME pick a MODERATE for VP!